Hospitals in England are being hit by “stealth cuts” of more than £2 billion ($3.03 billion) since 2010 according to new research, blaming the cuts for "rapidly deteriorating" hospitals’ finances. Tariffs – hospital price payments per procedure, fixed by the National Health Service (NHS) – have been massively reduced in the past five years according to research carried out by the False Economy think tank, which was commissioned by the TUC and Unison. And those tariffs are where two-thirds of English hospitals' income comes from, the study adds. The research found that one of four elective procedures, such as treatment for blood poisoning or diabetes, have had their tariffs slashed by more than 40 percent since 2010. By examining 138 NHS procedures, the researchers found that between 2010 and 2015 hospitals suffered an income loss amounting to £70 million ($106). Some treatments suffered cuts of 85 percent, including leukemia, asthma and sickle cell anemia, while cash for conditions like tuberculosis and glaucoma had been reduced by more than 70 percent and conditions like septicemia and kidney stones have had the amount given to them reduced by more than half. When applied across all 4,500 tariffs, which make up most of the funding given to hospitals, the cuts amounted to more than £2 billion ($3.03 billion) over five years, making a mockery of the government’s claim that funding for the NHS has been ring fenced. “These stealth cuts may have been largely hidden from the public eye, but the effects are grave. 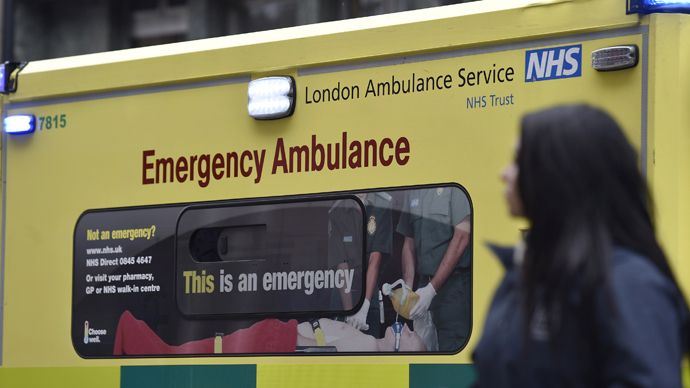 The NHS is in a rapidly deteriorating financial position, with hospital finances in steep decline,” said Frances O’Grady, TUC general secretary, in a statement. Dr. Mark Porter, the head of the British Medical Association, said that the reductions in tariffs are part of a wider problem of cost cutting in the NHS. “Cutting hospital tariffs causes real hardship for NHS services which are already struggling under rising patient demand, especially from an ageing population. This will push NHS organizations further into deficit, making a mockery of claims to have protected the NHS from cuts,” he told the Independent. However, the NHS insisted that funding is going up rather than down. “Rather than being cut, hospital funding in England has gone up, rising over the past three years from £49 billion to over £56 billion, a real terms increase of 9 percent,” said an NHS spokesman in a statement. A spokesman for the Conservatives also insisted that hospitals had seen an increase in their budgets. “Getting efficiency from the tariff is an important part of driving better value for taxpayers from the NHS, which is why it has been the policy of successive governments. Hospitals have seen real-terms increases in their budgets this Parliament, and unlike Ed Miliband, we’re committing to the £8 billion the NHS says it needs to transform community care,” he said. However, NHS providers, like organizations providing mental health and ambulance services, are opposed to the cuts in tariffs. “It is now widely accepted that 2015/16 will be the most difficult financial year for the NHS in its recent history,” they warned in January, according to the Independent.